Who doesn’t love a one-dish meal? Something that you can put together, stick in a pot or the oven and forget until it’s done. Soups, stews, crock-pot meals, casseroles. Most can be made ahead and cooked whenever you’re ready. All are great choices for busy cooks. This seafood casserole combines some of our favorite things – shrimp, crab, tuna, rice. Yum. It’s great for a family meal, but good enough for company, too. One word of warning – it’s very rich. A small portion goes a long way! Serve something light, like a fresh green salad, on the side. I like the mixed field greens with a classic vinaigrette. A citrus based dessert is particularly good with this casserole. Yes, the recipe starts with a box mix! 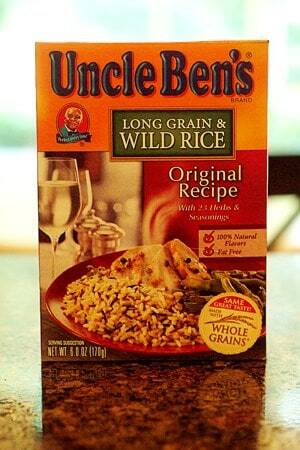 Now, if you want to make your own seasoned long grain and wild rice, please be my guest. I don’t mind taking some help from a mix once in a while. Cook rice according to the package directions. Set aside. Chop the peppers, onion, garlic and celery. I mixed up the colors of the peppers, but you can use all green, all red, whatever you like. Next melt 1 tblsp. butter and olive oil in a large skillet. Cook celery, onion, and bell pepper until tender. 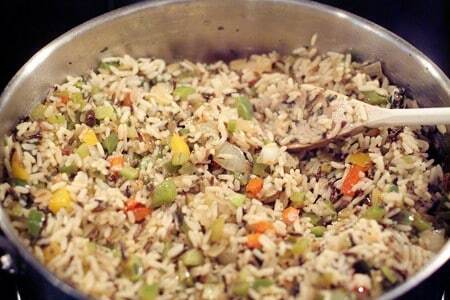 Drain the rice mix and add to skillet with vegetables. Stir together well to blend. Bring 4-5 cups of water to a boil in a large pot. Cook the shrimp briefly just until they turn pink (approximately 2 minutes). Drain shrimp. In a large bowl combine the well-drained shrimp, crab meat and tuna. Add the cream of mushroom soup, mayonnaise, Worcestershire sauce and salt. Add the rice and vegetables mixture to the seafood and mix well. Turn the mixture out into a well-greased 9×13 casserole dish. Evenly sprinkle the top with bread crumbs. Pour melted butter over bread crumbs. Bake for 30-45 minutes or until bubbly. Makes 10-12 servings. A casserole with a variety of seafood and wild rice. Meanwhile, melt 1 tblsp. butter and olive oil in a large skillet. Cook celery, onion, and bell pepper until tender. In a large bowl combine the well-drained shrimp, crab meat and tuna. Add the cream of mushroom soup, mayonnaise, Worcestershire sauce and salt. Turn the mixture out into a well-greased 9x13 casserole dish. Evenly sprinkle the top with bread crumbs. Pour melted butter over bread crumbs. One-dish meals are probably one of teh best thing there is. Look at all the shrimpy goodness in there!! Yes, we really enjoy one-dish meals here. Easy to prepare and easy to clean up. Thanks, Jenn, for always stopping by and leaving a comment. It’s much appreciated! I am going to make this the next time I have company. Looks so good. It’s a really good company dish. Very tasty and looks impressive on the plate. For company, I’d serve with some garlic bread, green beans or sugar snap peas and a side salad (maybe a fruit salad). Can’t really beat a casserole, can you? Wow I am so happy to have found this recipe! I love seafood and could live on it alone. Thanks so much! I hope you’ll try it, Ruth, and that you’ll enjoy it as well. I was browsing on Tastespotters and saw the beautiful picture of your Seafood casserole. I belong to a book club of about 16 women who will love to eat this at our next meeting. Thank you. It’s always great to have leftovers, isn’t it? And like lots of casseroles, this one is even better the next day. Looks great. This would really be a good thing to put together the night before, when you are having company and are pushed for time the next day. I have an idea – with the holidays approaching, why not show folks some of the standards. I am thinking of that because I have a turkey breast in the oven and dressing ready to go in a few minutes. There are lots of folks who are intimidated by the dishes that only their grandmother used to cook! Delicious dishes and great photo. I have to agree with you on the one-pot meals! Casseroles are so good and this one looks great! Thanks so much! I have to say it’s a teeny bit intimidating to think there’s a real chef reading my recipes. Yikes! Hope I haven’t goofed up too much. How long does it bake for ? The directions are wrong. Thanks for letting me know! So sorry. It should read “Bake for 30-45 minutes or until bubbly.” I’ve corrected the post. I tired this but used chicken instead, it was very yummy. If you are asking about re-heating the leftovers in the microwave, then I’d say use the very shortest time possible. Microwave cooking usually makes shrimp pretty rubbery. Hi, I was wondering if I could just put the raw shrimp in the casserole before baking, since it’s going to sit in the oven for 35 min- won’t the shrimp get too tough ? Helen, I’ve never cooked it that way so I can’t say. I’ve never had the shrimp to get tough. I put everything in raw, didn’t come out tough at all. Very moist. Thanks for responding. I need your advice. My in-laws are coming today and I want to impress them without going through too much trouble. What do you suggest as far as menu goes? I was thinking about making this casserole, but no ideas on dessert…. Maybe you have better ideas? Hi Helen. I have quite a few dessert recipes on the blog. Take a look through the “Recipe Index” page and see if there’s something you like! I have made this casserole today- it was delicious- I did use 2 boxes of Uncle Ben’s rice though ( we eat a lot) and served it with the salad I created -yum! Casserole was really good! Thanks, Lana! I made this, but used cod instead of Tuna, and frozen shrimp & crab. But I live in the Pacific NW, we don’t use canned seafood here. Very yummy, I’m going to try it with some cajun seasoning next time. It’s very good with Frank’s Hot Sauce on it. I made this casserole as a part of my Christmas brunch this year, along with several other items. It was a hit with everyone around the table, and provided a wonderful addition to the overall menu. Other than substituting mushrooms for the peppers (peppers don’t get along with my stomach, unfortunately) and using reduced-fat olive-oil based mayo, I made no ingredient changes, and the result was delicious. I did mix the breadcrumbs with the melted butter in a skillet and toast them slightly before adding, because I felt the result would be more uniform. I also sprinkled the top with a small amount of shredded Parmesan and dusted with paprika for color. Excellent! Thanks for a great addition to my casserole collection!